<b>You’ve seen our production of <a href="https://www.youtube.com/watch?v=Y8oDnUga0JU">Virtual Choir 4: Fly to Paradise</a>, now it’s your turn. The community takeover</b>. We’re providing the tracks of the final master for you to create your own remix. Whether you’re a choral purist, a music pro, a budding DJ or always looking to experiment with technology, this is your chance to create something new. Just remember to watch out for the tempo changes: Bar 1 - 80bpm, Bar 21 - 76.5bpm, Bar 55 - 80bpm, Bar 64 - 76.5bpm. 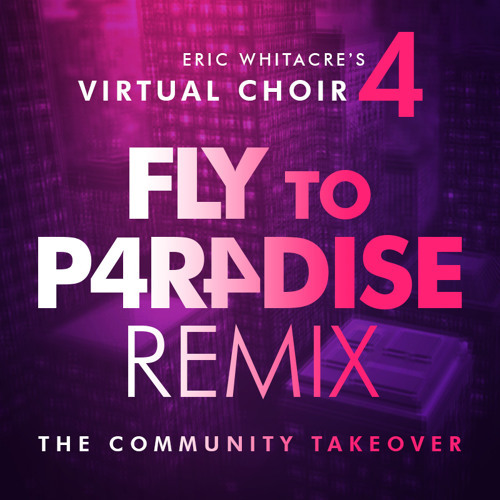 <a href="http://ericwhitacre.com/the-virtual-choir/remix"><b>Visit the Virtual Choir website</b></a> and <a href="https://soundcloud.com/groups/fly-to-paradise-remix"><b>join the SoundCloud group</b></a> for all the info and to download the Remix Pack. Terms and Conditions apply.